Growing vertically is all the rage right now, and it’s one of the best ways to add beauty to your garden. 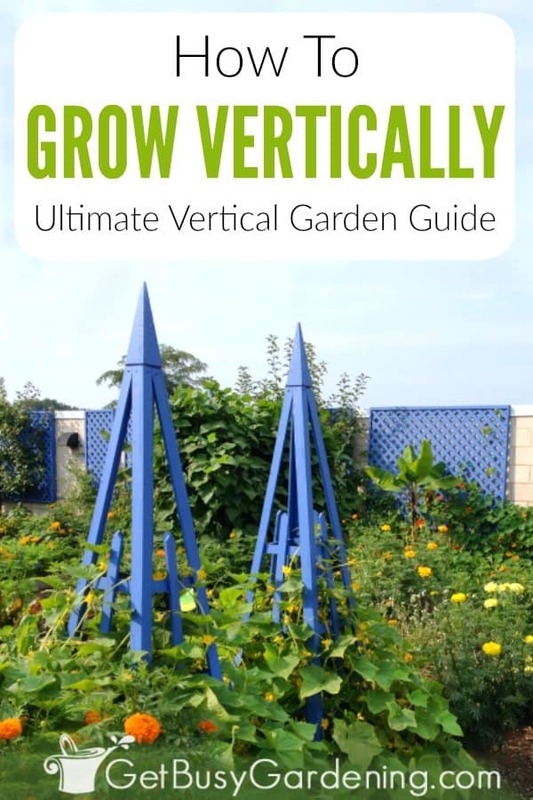 In this guide, I will teach you all about growing plants vertically. I’ll share the benefits and techniques, and give you design and care tips. Plus you’ll learn how to choose vertical growing structures and plants, and get some fun DIY project ideas. If you’re looking to add some unique character or charm to your garden, then growing vertically is just what you need! It’s fun and addicting, and truly a wonderful way to garden. 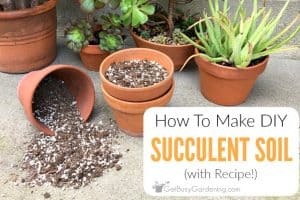 Once you discover all of the amazing techniques that you can use to grow plants vertically, it will open your eyes to a whole new way of gardening. Use this guide as your starting point for everything you need to know about vertical growing. Since this is such a huge topic, it can’t possibly be covered completely in only one blog post (heck, I wrote an entire vertical gardening book!). So, in this guide, I am going to give you a detailed overview of growing vertical. I will also give you links to additional articles where you can learn all the details about each specific topic. There are tons of benefits of growing plants vertically. The main one is that it allows you to grow more plants in less space. This is especially beneficial in the vegetable garden! Another important benefit of growing vertically is that you can make use of areas where you otherwise wouldn’t be able to grow anything. You can grow plants on walls and fences, sitting on the deck, patio or driveway, or hanging from a balcony or porch. This is ideal for people with limited or no gardening space, and can provide exponentially more room to grow. Growing vertically not only saves space in the garden. It’s also healthier for the plants. Flowers and foliage (as well as fruits or vegetables) sitting on the ground are prone to rot, pest and disease issues. Another benefit of growing vertically in the vegetable garden is it makes harvesting simple. The fruit will hang down from the vine making it easier to find. When plants are allowed to sprawl on the ground, the vegetables get hidden under the leaves. Read the details about all of the benefits of vertical gardening here. These days, growing vertically is not just limited to staking plants out of necessity, or growing vining plants on a boring trellis. 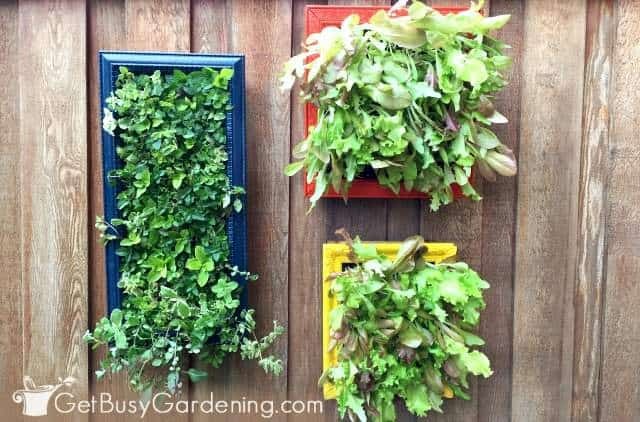 There are tons of types of vertical gardening systems you can use! Climbing plants can be trained to grow in so many cool ways. You can use them to add height, drama, privacy, and even an architectural element to the landscape. And, once you start thinking about vertical container gardens, you’ll be able to utilize areas that you never thought of before. From growing plants on walls and fences, to edible living art and stunning hanging gardens. Or how about tower gardens, tiered or trellised planters, or self-standing wall gardens. Heck, even indoor vertical gardening has become a huge trend! 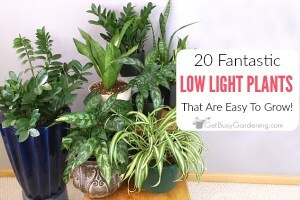 There’s no doubt that there are tons of fun and unusual ways to grow all kinds of different plants vertically. With all of these new and exciting ways to grow vertical, the possibilities for what you could do in your own garden are almost endless. 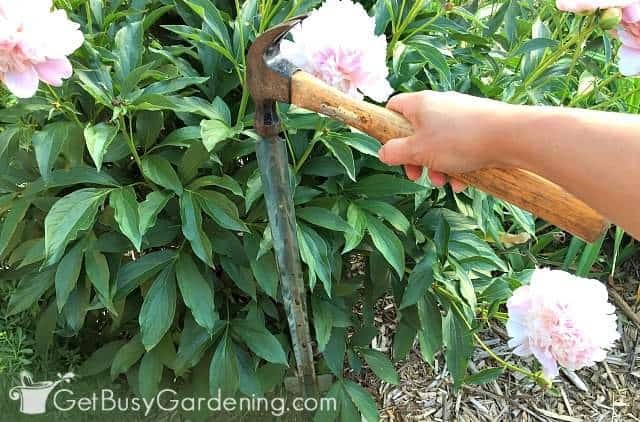 Some of the techniques I talk about in this post may be unfamiliar to new gardeners. Understanding these common terms will help you plan your vertical garden. Plus you’ll be able to choose the best technique to use for each of the plants you want to grow. Trellising is the technique used for growing vining or branching plants vertically. It’s a general term that is used in reference to any type of vertical growing support (e.g. : arbors, pergolas, obelisks…etc), and not just flat trellises. This is a very popular technique where a plant is encircled in a garden cage in order to keep it growing vertically. The caging technique can be used to grow any type of vining or branching plant, like tomatoes. 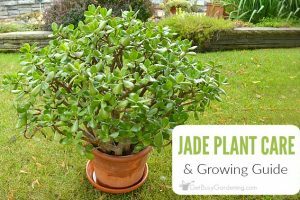 As long as the plant is small enough to stay confined inside of its dedicated growing structure. Staking is common practice, and probably the first vertical technique that most gardeners start with. 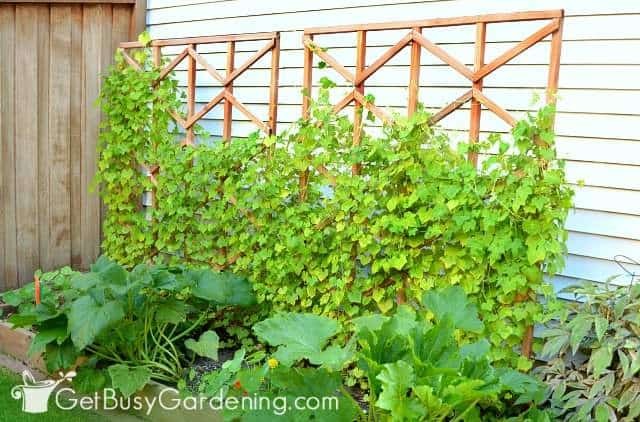 This is a popular way to trellis non-vining plants. 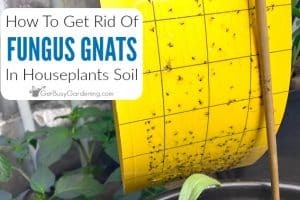 You can also use this technique to give plants extra support so they won’t flop over as they grow larger. Most types of vining plants will need to be trained to some extent in order to grow vertically. This is especially true for plants that don’t grab onto the structure on their own. In this context, training simply means showing the vines or stems where to go, and attaching them to their support when necessary. Vertical container gardening is a broad term that I use to describe vertical gardens that are grown in any type of container. Stacked planters, wall pockets, hanging baskets, and tower gardens are all good examples. Now that we’ve talked about all of the awesome ways we can grow plants vertically, let’s get to the fun part. Talking about the different types of vertical structures and supports! When it comes to supports for growing climbing plants, there are tons of fun options to choose from. The type of support you use could be as simple as a wire tomato cage or small fan trellis. 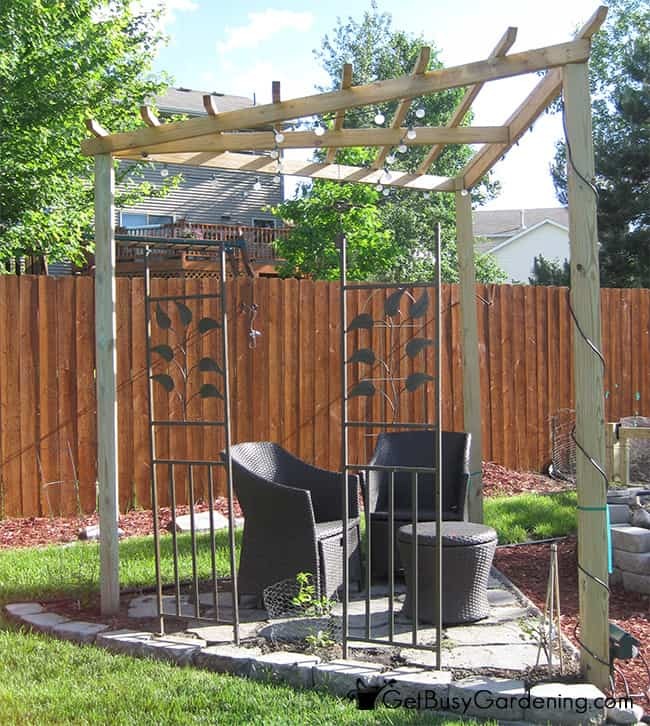 Or it could be more elaborate like an arbor or a pergola. Trellises come in tons of different shapes and sizes, so you’re sure to find something that will work in your garden. Or try something different like a teepee, obelisk, arch, a-frame or lean-to style structure. Vertical container gardens come in lots of different varieties too. Tower gardens, hanging baskets, wall pockets, living walls, stacked planters, and picture frames are a few of the most popular options. You can buy them, or build your own vertical grow system. Structures and supports can be made out of just about anything. From homemade wooden structures, to using upcycled materials. Heck, you could even fashion something together using items you have in the garage. It’s so fun to visualize and dream about all the fantastic growing structures that you could add to your garden. But, before you start randomly adding these elements, it’s important to do some planning first. The first thing to figure out when planning to grow a vertical garden is where will the structures fit in the best. 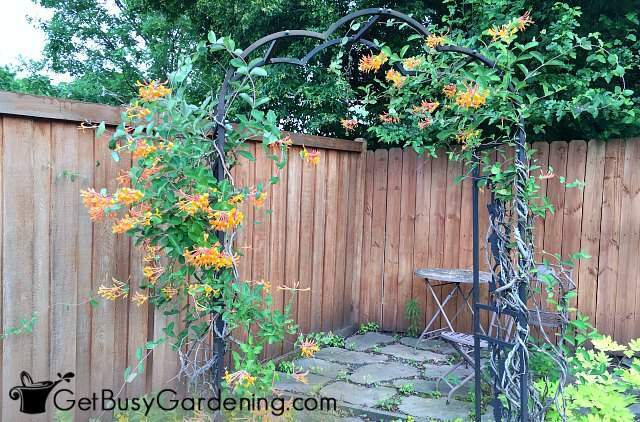 Don’t just plop a tall trellis in the middle of the garden, or hang a tiny picture frame on a large blank wall. If you take this haphazard approach, you will likely be disappointed, and your plants may not grow very well. Think about the size and style of your garden first. Then choose vertical supports that will work well, and fit with the existing space. The maximum height a vine will grow is different depending on the type of plant. Vines can stay short, only growing a few feet tall, like peas. Or they can grow to the top of a tree, like giant pumpkins – or anywhere in between. So, when you’re choosing a support for vining crops, be sure you know the height of the full sized plant. Then choose something that’s tall enough so the vine has plenty of room to grow. And also so that the plant won’t end up overwhelming the structure once it’s full grown. Keep in mind that once the plants grow large, they can become very heavy. This is especially true for vegetable plants when they’re full of produce. So be sure to choose a support that is sturdy enough to hold the full weight of the mature plant. Harvesting is usually easier in a vertical vegetable garden, but using the wrong type of support can actually make it more difficult. So this is definitely something you’ll need to keep in mind when growing vegetables vertically. A support that keeps the vines in a tight cluster, or one that’s difficult to reach the center may not be the best choice for growing climbing vegetables. Something that is really tall may also make harvesting difficult if you can’t reach the top. Well, unless you don’t mind getting out the ladder once and a while that is. 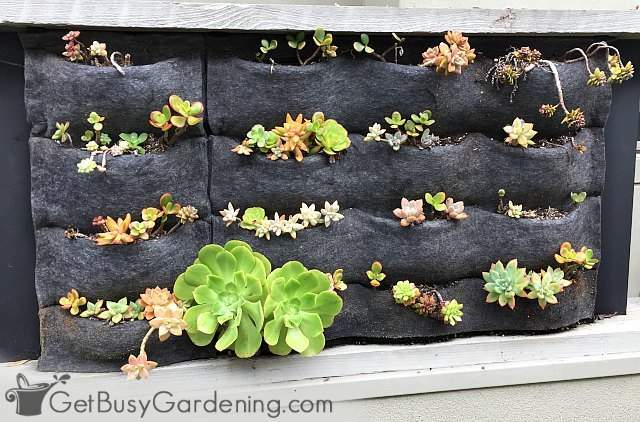 Learn all about designing and building a DIY vertical garden here. When it comes to choosing plants for growing vertical, vining plants are the obvious first choice. One of the easiest and fastest ways to add character, structure and height to a garden is to grow climbing plants. Vertical growing plants are landscape features all by themselves, and they also make a gorgeous backdrop for other plants in the garden. You can add colorful flowering vines to your perennial or annual gardens, and highly productive vining crops to your vegetable garden. Here’s a list of some of my favorite trellis plants. When you start thinking about growing in containers, the options for what you can grow vertically are almost limitless! There are wonderful varieties of bush or patio plants for just about any type of vegetable, fruit or flower you want to grow, which is great news for those of us who like to get creative. Learn how to choose the best vertical garden plants here. One of the biggest benefits of growing vertically is that it makes caring for your garden easier. Growing plants vertically keeps them out of reach of pests, and helps prevent the spread of disease. It can even make tasks like watering and weeding much more manageable too. When it comes to watering plants, it’s best to water them at the base rather than over the top of the leaves. This helps to prevent fungus and disease issues, and also conserves water. Learn exactly how to water your garden the right way here. If watering is a huge chore for you, then try installing a drip irrigation system. Or you can weave a soaker hose through your garden. Hook them up to a digital hose timer, and watering becomes a snap! Growing plants in vertical container gardens means you won’t have to struggle with weeds all summer long. But, weeds can quickly become a huge problem in a garden plot. The best way to deal with weeds is to keep them from growing in the first place. So be sure to mulch your garden heavily to stop the weeds from growing. Dealing with destructive pests is another huge struggle for gardeners. Growing plants vertically helps keep ground-dwelling pests away, but that doesn’t mean your garden will be pest free. Just remember that not all of the bugs in your garden are bad, and healthy plants can handle being munched on once and a while. But, if you’re at your wits end, and the pests have taken over, then it’s time to act. Just be sure to stick to natural garden pest control remedies to get rid of them. When climbing plants are young, you may need to train them to grow on the support. They are fragile when small, so take care not to break the stem of the plant as you train them. If necessary, tie them loosely to the support with a flexible plant tie or wire twist ties. Tying them too tight may cause the tie to cut into the stem when the vine grows thicker. 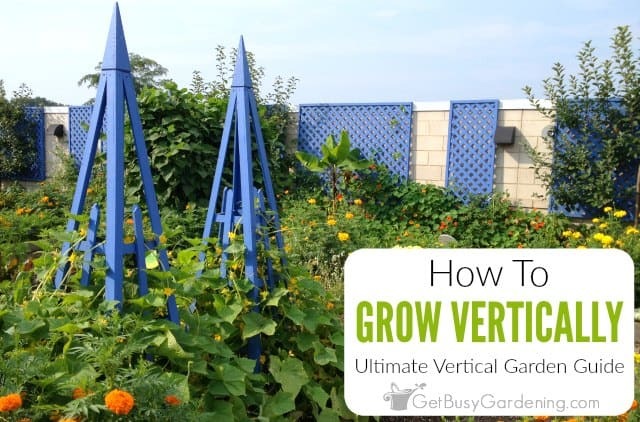 If you’re a DIYer like I am, then you’ll love building your own vertical growing structures! I have several DIY projects to get you started. 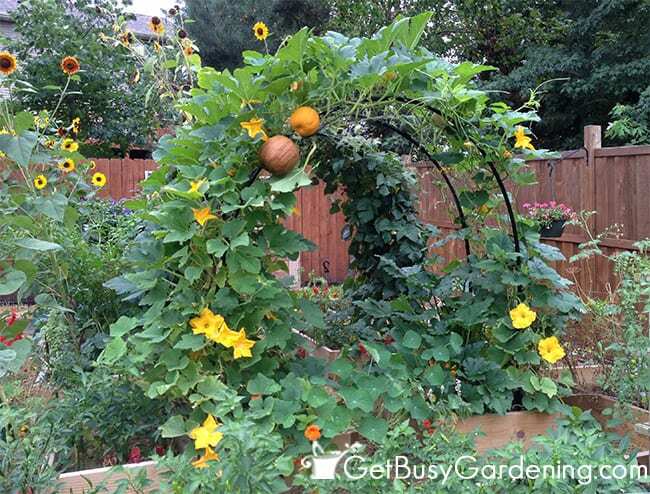 Why not add a gorgeous DIY arch to your garden, or build some wooden garden cages for supporting your tomatoes and other larger plants. You could also try making my super simple cucumber trellis or a fun pea arch trellis, which could also be used for growing flowering vines. If you’re not a handy person, than the easy tiered planter or sturdy concrete block planter projects would be perfect for you. If you want to build even more of your own vertical structures, then my new book Vertical Vegetables is just what you need! It has step-by-step instructions for building almost two dozen unique DIY vertical growing projects. Growing vertically is the perfect way to add beauty and character to your garden, and increase yield in the vegetable garden too. If you’ve never tried vertical growing before, I hope you will give it a try. I think you’ll love it just as much as I do! Want to learn even more about vertical growing? 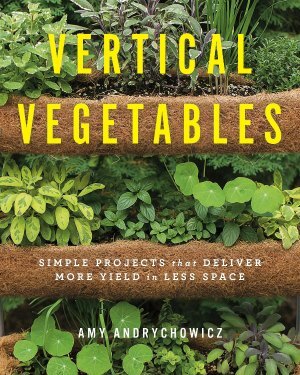 Then you need to order a copy of my Vertical Vegetables: Simple Projects That Deliver More Yield In Less Space book! It has everything you need to know in order to grow all of your crops vertically! Plus more than two dozen detailed step-by-step DIY projects that you can build in your garden for growing vertically! Order your copy now! Share your tips and advice about growing vertically in the comments section below! This is the first year we’re seriously going vertical. We finished an arch last week, probably for runner beans. We made it tall enough to walk through and now I’m afraid that’s going to be too tall come harvest time–not to mention how long it will take (if ever) for the vines to cover the arch. We’re also converting some display units from a map store we formerly owned into trellises–very proud of this (F)re(E)cycling and can’t wait to see how it works. How tall did you make your garden arch Carole? Mine is 6 feet tall and, for the most part, easy to harvest. Most of the beans hang down, and are easy to reach. Once and a while I’ll need a step stool (or my husband) to harvest the ones sitting on top. Pole beans grow so fast, they reached the top of my arch in only a few weeks from the time the seeds sprouted. The entire arch was covered very quickly (even faster than the squash covered it last year). 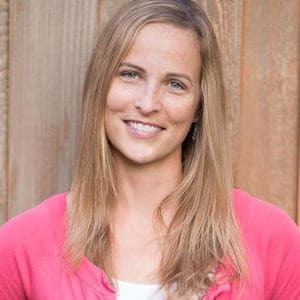 Your freecycling project sounds awesome, I love it! We started growing vertically after seeing my neighbors try it a few years ago. 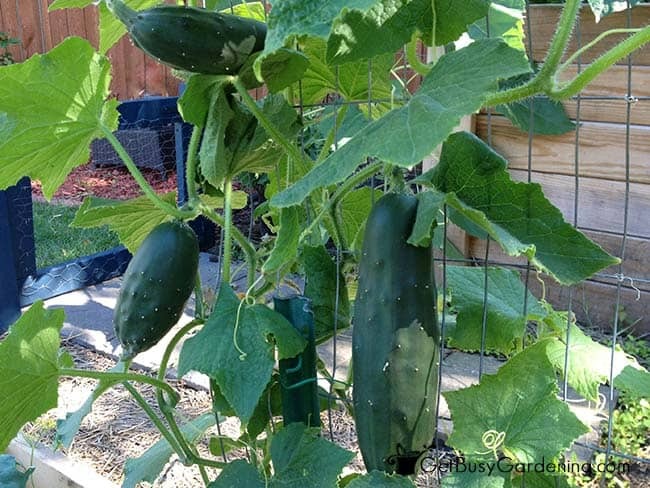 Her cucumbers were perfectly dangling from cute trellises while my cucumbers were rotting and turning yellowish! Enough of that I said to myself, we’re going vertical! I love it too because it keeps pests away more, in particular slugs which just gross me out. I really don’t like even eating veggies that have slugs on them! And like you said, in my raised bed I can plant even closer together and get a higher yield, which is always the goal. Aaahhh, a kindred spirit! I love growing up! I have limited space to garden, so I am a big fan of vertical gardening. This year I built some towers for my strawberries, those are growing well. I love that you made your raised beds stylish. I’m always trying to get people to add some paint to their beds – they have to look at it all the time, it should be pretty! I hope you keep up the good work on your blog! Awesome to hear that you have become addicted to vertical gardening too! 🙂 Thanks for your compliment about my raised beds, I’m happy with how they turned out. Hello! I’m growing Sugar Pumpkins vertically for the first time this year :)) How long do the vines get? I just want to make sure I have a large enough trellis for them from the start! Thanks! How fun, I love growing sugar pumpkins! I’m not sure what the max length of the vines is, but you definitely need a tall and sturdy trellis for them. Don’t make it too tall though, or you’ll need a ladder to harvest them. 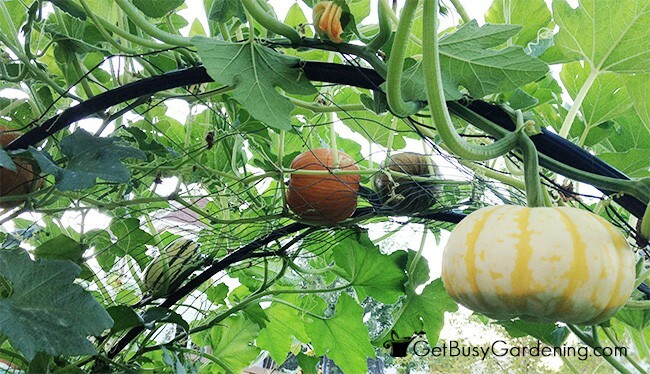 🙂 My favorite way to grow my sugar pumpkins is on my squash arch. The arch is about 6′ tall and the vines grow all the way over the top and almost reach the bottom of the other side by the end of the summer! I’m going to try growing vertically this year to try to be more efficient with my limited garden space. Thanks for this helpful post. You raised some points I had not considered. You’re welcome, glad I could help. Good luck with your new vertical gardens!